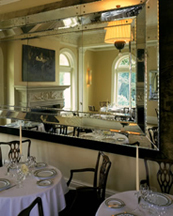 The Dining Room at Wheatleigh in Lenox, Massachusetts in The Berkshires recalls the splendor of the Gilded Age. 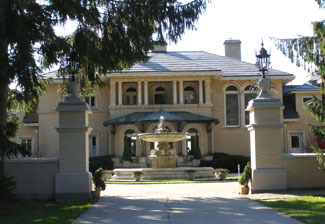 Built as an Italian villa in 1893 on 22-acres overlooking the Berkshire Mountains as a private summer residence, Wheatleigh is a luxury hotel with an award-winning restaurant featuring Chef Jeffrey Thompson's contemporary American interpretation of French cuisine. Once the summer residence of Henry Harvey Cook and Mary McCay Cook, and later inherited by their daughter, Georgie Cook de Heredia and her husband, Carlis de Heredia, Wheatleigh, now owned by Susan and Linfield Simon, is a luxury hotel featuring 19 exquisite suites and rooms. Their restaurant, The Dining Room at Wheatleigh has won many awards including the prestigious American Automobile Association Five Diamond award. Edward and I stayed at the hotel in November 2009 and had the opportunity to experience a delightful lunch in The Library at Wheatleigh where we sat at a table by a large Palladian window and soaked up the bright autumn sunlight and enjoyed the spectacular view of the mountains. The room had a high ceiling, Delft china in glass cases lined the walls, and a white marble fireplace with blue and white ginger pots accessorized the mantle. The walls were painted various shades of butternut, burnt orange, and sienna that were accessorized with paintings, and were dramatic against the dark wood doors and the pristine white ornate molding. A green leather banquette was flanked by bottle green leather and wood chairs, a large lamp shade covered fixture hung from the center of the room, tables were dressed with woven runners and acrylic salt and pepper grinders, and a patterned sage carpet on the wood floor completed the contemporary décor. 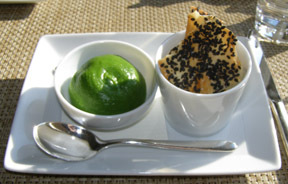 We began lunch with an aperitif of Pol Roger champagne, which was the perfect pairing for the amuse bouche of broccoli mousse with black sesame lavash, accompanied by French baguettes and butter. 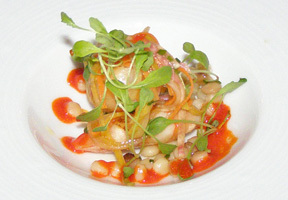 Chef Jeffrey Thompson celebrated autumn with his seasonal menu that included Fall Greens with Blue Cheese, Honeycrisp Apple, and Spiced Nuts, which Edward had as his starter. 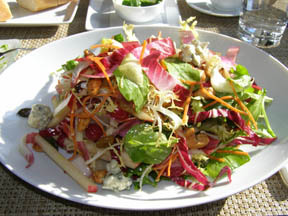 This colorful salad was a poem and echoed the season with a gorgeous mélange of julienne apples, cranberries, raisins, fall greens, radicchio, curly endive, julienne carrots, glazed almonds and cashews, pumpkin seeds, and generous amounts of bleu cheese, and was lightly dressed with a hint of sweetness that contrasted beautifully with the tangy bleu cheese. 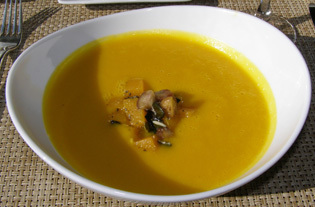 I had a lovely Butternut Squash Soup, with Orange, Rosemary, and Chestnuts as a starter, which was beautifully presented in a deep bowl with diced squash and red potatoes placed in the center, and the soup poured tableside. The soup was rich and flavorful, and the diced squash and the red potatoes added interest as well as texture to this starter. 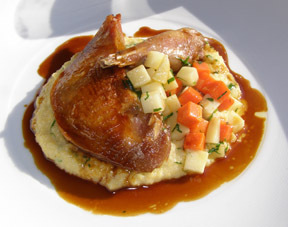 For his main course, Edward had a special course of Pheasant with Polenta, which was attractively presented as two pieces of golden brown and glazed pheasant on a generous bed of creamy polenta, crowned with diced carrots, parsnips, and chiffonade herbs, with a rich pool of sauce surrounding the polenta. 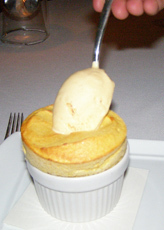 Paired with a glass of Pol Roger champagne, this course was absolute perfection. I continued with Smoked Salmon and Artichoke Quiche, with Arugula, Radish, and Fennel, which was also well presented. The quiche had a delicate crust and a golden gratin crown with a sumptuous filling of smoked salmon and artichokes in a rich and creamy sauce, and was accompanied by a mille-feuille of smoked salmon, mesclun, thinly sliced radishes and shaved fennel, which I also paired with a glass of champagne. In the evening, we dined in The Dining Room at Wheatleigh, which was an elegant and memorable night that combined expertly prepared and presented cuisine with attentive and exceptional service. We sat at a table dressed with white linens and a hurricane globe gas lamp near the white marble fireplace where a plethora of white pillar candles glowed invitingly and softly illuminated the dining room, as did the sconces. The details of the room were lovely with an antique mirror gracing a taupe colored wall with ornate white molding, a painting hung over the fireplace, a wood table placed in the center of the room was accessorized with green plants in pots, and the waning full moon was visible from the large Palladian windows. As I took in the architectural details of the attractive room I noticed the faces of cherubs on the white marble fireplace and was delighted to note that the faces were adorably different. Another architectural detail that caught my eye was a metal lever on the wall near the fireplace, which I later learned was original to the mansion and was used to control air ventilation of the fireplace. Although it is no longer functional, it remains as a testament to time and the innovations of the Gilded Age. We toasted the evening with a glass of champagne to accompany the amuse bouche of pistachio mousse piped on spoons and celery root mousse with diced root vegetables presented on baguette toasts. The Dining Room at Wheatleigh offers two options for dinner, a four-course menu or a grand Chef's Tasting menu, which was the perfect solution for us, as the four-course menu provided me with a lovely look at the style and vision of Chef Jeffrey Thompson's approach without feeling overwhelmed, while the larger Chef's Tasting menu provided Edward with the opportunity to experience the inspired menu of 7 courses, which began with Hamachi Sashimi with Matsutake, Edamame, and Shiso beautifully presented on a rectangular block of pink Himalayan salt and paired with a 2008 Château Bertinerie, Cru Reserve, 13% alcohol, Blaye, Côtes de Bordeaux, France, with crisp, pear, and mineral notes on the nose, and slate and citrus on the palate. 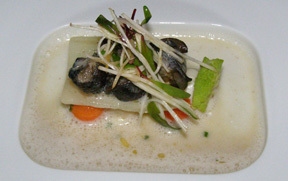 For the next tasting, there was Wild Burgundy Snails with Potato, Celery Root, and Averdale Cauliflower presented in a round plate with a deep rectangular inset that was filled with snails on a bed of thinly sliced celery root atop miniature carrot balls and garnished with julienne celery root and mesclun, and was paired with a 2007 Trefethen, Family Vineyards, Chardonnay, Oak Knoll District of Napa Valley, California, which had mineral, slate, and white peach on the nose as well as on the palate. Edward became enamored of snails during a month-long trip to France several years ago when we drove through the Burgundy region, and Chef Jeffrey's interpretation recalled fond memories of our trip. The tasting continued with Foie Gras au Torchon with Apple Ice Wine, Hazelnuts, and Radish, which was also well presented. The apple ice wine gelee with its delicate hint of sweetness from the Quebec region was a lovely complement to the foie gras. 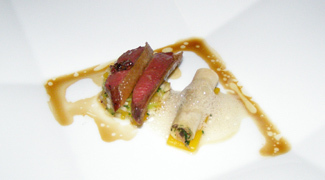 Squab with Cepes, Butternut Squash, and Cocoa Nib was the fourth course of the tasting, and was also well presented and paired with a 2005 Rochford, Pinot Noir, Macedon Ranges, Australia with its aromatic nose, deep dark berries and hint of dark chocolate on the palate. 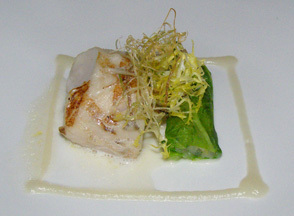 For his fifth course, he continued with Alaskan Cod with Savoy Cabbage, Sunchoke and Burgundy Truffle, which was a gorgeous presentation of Alaskan cod with a crown of sunchoke puree and a Parmesan crisp. 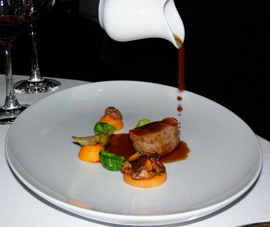 Edward continued with Jamison Farms Lamb with Sweet Potato, Artichokes, and Brussel Leaves paired with a 2006 Casa Lapostolle, Cuvée Alexandre, Apalta Vineyard, Merlot, Colchagua Valley, made with a blend of 85% Merlot and 15% Carmenere that offered rich deep black fruit, plums, and hints of spice on the nose and palate, and had enough body to complement without overpowering the lamb. My four-course tasting began with a surprise from Chef Thompson of Shrimp with Julienne Salad and Couscous, which was elegantly paired with a 2007 Jean-Marc Brocard, 12.5% alcohol, Chablis, Domaine Sainte Claire, France with clean, crisp apples on the nose and the palate. Next, there was a gorgeous presentation of Spiny Lobster with Hearts of Palm, Citrus, and Tamarind on a teardrop shaped white plate. The exotic flavors in this course melded beautifully and were well complemented with a 2007 Jermann, Pinot Grigio, Veneto, Italy with its clean and rich fruitiness on the nose and the palate. A Sunchoke Soup with Beets, Savoy Cabbage, and Ravioli followed, which was another delightful course offering lovely surprises of deep-fried golden sunchoke and cabbage ravioli, beet salsa, and sliced beets on the bottom of the bowl. 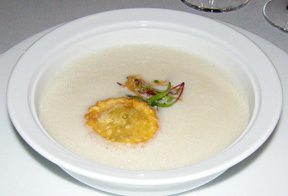 The deep-fried ravioli was a well thought out addition, which was not only visually appealing, but also added texture to the creamy soup. 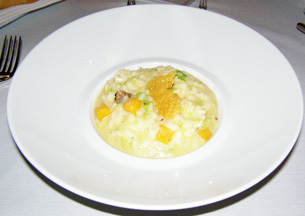 For my entrée I had White Alba Truffle Risotto, with Fall Squash, Chestnuts, and Cured Lemon that was creamy perfection and deliciously paired with a 2004 Domaine Richard Condrieu L'Amaraze, Rhone Valley, France. 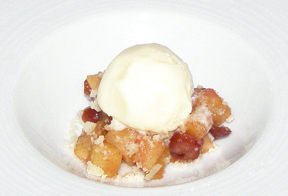 Chef Thompson surprised us with a pre-dessert of apple and cranberry crumble with crème fraiche ice cream, followed by a dessert of Black Mission Figs with Chocolate Ice Cream on a bed of filleted oranges for Edward, and a light, perfectly puffed, and delicate savory Butternut Squash Soufflé paired with Spiced Orange Sorbet for me. As a sweet finale to our enchanting evening at The Dining Room at Wheatleigh, Chef Jeffrey Thompson sent us a plate of mignardise of caramel truffles with fleur de sel and passionfruit paste. Wheatleigh serves lighter fare in The Library with lunch served in summer and winter, Monday through Saturday from 12:00 pm until 2:00 pm, and dinner in the summer, Sunday through Thursday from 5:00 pm - 9:00 pm, on Friday and Saturday from 5:00 pm until 9:30 pm. During winter, dinner is served Sunday through Thursday from 6:00 pm until 8:30 pm, and on Friday and Saturday from 6:00 pm until 9:00 pm. Sunday Brunch is served from 9:30 am until 1:00 pm. Dinner is served in The Dining Room during the summer from Sunday through Thursday from 5:00 pm until 9:00 pm, and on Friday and Saturday from 5:00 pm until 9:30 pm. During winter, dinner is served Sunday through Thursday from 6:00 pm until 8:30 pm, and Friday and Saturday from 6:00 pm until 9:00 pm. Read about Wheatleigh in the Hotels and Resorts section and in the Chefs' Recipes section where Chef Jeffrey Thompson shares a delectable taste of The Dining Room at Wheatleigh with his recipes for Pan Seared Foie Gras, Puy Lentils, Baby Turnips, Green Apple Mustard Sorbet; and Sablefish, Parmesan Gnocchi, Cauliflower, and Shellfish Boudin.